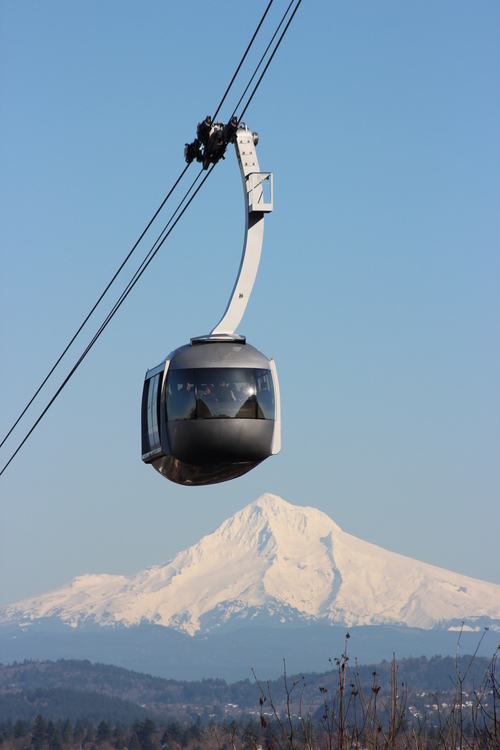 (Nov. 16, 2016) – The Portland Aerial Tram will close for scheduled maintenance from 7 p.m. on Tuesday Nov. 22, reopening at 5:30 a.m. on Monday, Nov. 28. The work is scheduled for the Thanksgiving holiday weekend, when the tram experiences lower than normal use and closes for the national holiday. During the closure, shuttle buses will run between Oregon Health & Science University’s South Waterfront and Marquam Hill campuses. Passengers can catch a shuttle bus from the Center for Health & Healing in South Waterfront and the Kohler Pavilion roundabout on Marquam Hill. The closure will allow crews to replace the tram’s haul rope. The haul rope, used to propel the tram cabins from one station to the other, must be replaced periodically. It was last replaced in 2010. The Portland Aerial Tram is owned by the Portland Bureau of Transportation and operated by OHSU. Photo courtesy Portland Bureau of Transportation. The Portland Aerial Tram is one of the busiest aerial tramways in the world, providing more than 12 million rides since opening in 2007. After more than 21,800 hours and 325,000 trips, the haul rope is near the end of its useful life. Though shuttles will be available during the tram’s normal operating hours, with more running during peak times (7 to 9 a.m. and 4 to 6 p.m.), please plan to add as much as 30 minutes to your time in transit. If possible, avoid scheduling meetings and appointments on the hill and at the waterfront on the same days. Shuttles will be accessible to people using wheelchairs or other mobility devices. The tram is normally closed on the Thanksgiving holiday, and the shuttle service will be closed as well. The Go By Bike bike parking service will move to the Whitaker lot (just east of the lower tram station, between SW Bond and SW River Parkway) with temporary fencing from Friday, Nov. 18 until Tuesday, Nov. 22. Additional bike parking will also be added on Marquam Hill during this closure. This November shutdown could be seen as a trial run for much more intense work happening in Spring-Summer 2018. During that time, the tram will be down for five weeks for a required maintenance service, known as track rope slipping. Track rope slipping is a labor intensive project that normally takes up to eight weeks, but tram operations staff are committed to completing it in five weeks. With two dozen crew members working up to 14 hours a day, this will be their biggest project yet.